If you’re thinking about investing in a new pool for your home, you’re not alone. According to the Association of Pool and Spa Professionals and the U.S. Census Bureau, more than 10 million homes in the United States have a pool. That’s not surprising when you consider that swimming is the fourth most popular sport or activity in the nation. Why are so many Americans willing to invest the time and money necessary to build a new pool? The answers might surprise you—the fact is that the benefits of having your own pool extend well beyond spending some extra time in the sun and lounging around on your favorite float. 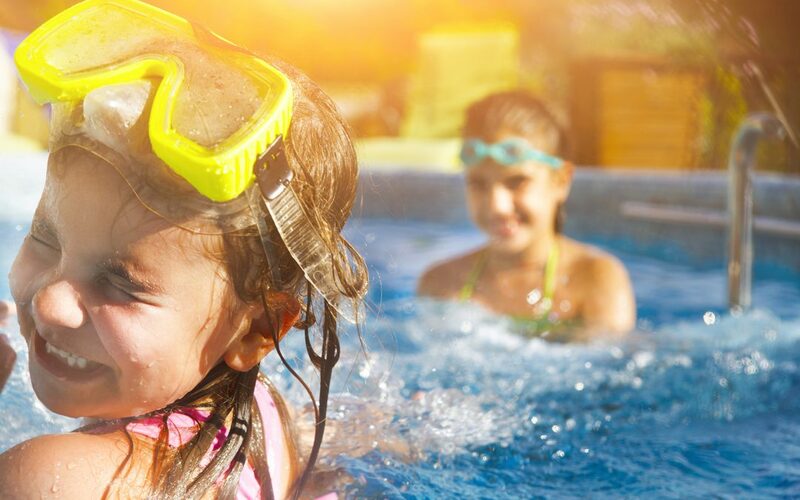 A new pool is a great way to increase family fun, save money on expensive vacations, make your home the envy of your neighborhood and increase the value of your home. You’ll add to quality family time: building a new pool creates unparalleled opportunities for fun and relaxation with the entire family. The activities you can share with family members include everything from teaching your young children how to swim to enjoying family barbecues to hosting neighborhood get-togethers—all of which will create enduring memories for the entire family. If your family is important to you (and it probably is! ), you’re always looking for new ways to enjoy time with them, and to make their lives more enjoyable. A pool is a virtual guarantee that you’ll increase the amount of quality time you get to spend with them. You’ll save money with fun “stay-cations:” most families have at least two vacations each summer—and that can be expensive when you consider travel, rental and related costs. With a new pool, you can save money by having one or more of your vacations at home. A new pool becomes your own personal resort right in your own backyard—your own personal oasis in the middle of your backyard. Your home can become “party central:” there’s no better way to throw a party for your friends and neighbors than around the family pool. You’ll have no problem getting guests to show up when the invitation you send is for a fun pool party—and no problem making sure they always have a great time. You can tear up that gym membership: according to WebMD, swimming is among the most effective and least stressful forms of exercise. It’s a great way to have an intense cardio workout, all without working up a sweat. As little as two hours of swimming a week is a great way to target your core, arms, legs, back and glutes. With a new pool, you’ll get the exercise you need in the comfort of your own home, and save on expensive gym memberships. Swimming is among the best ways to unwind: according to the Anxiety and Depression Association of America, anxiety and stress affect more than 40 million Americans. Swimming, or just relaxing in your pool, is one of the best ways to relieve the daily stress of work and other concerns—and swimming will help you sleep more soundly, all of which improves your overall health. It’s a great way to cool down: with a new pool, there’s no longer any need to isolate yourself in your home, just to take advantage of the air conditioning. And, with a pool, you’ll save money by switching off the air conditioning during the hottest summer days. You’ll keep your kids safe—and at home: it’s tough keeping your kids at home during summer vacation—and that can mean worrying about where they are and what they’re up to. Your new pool will act like a “kid magnet,” a great way to keep your kids at home where you can keep your eye on them and make sure they’re safe. You’ll add to the beauty of your home: there’s an aesthetic side to adding a pool to your home. You can choose a design which perfectly complements your home style and landscaping, and add attractive features which will make your home the envy of the neighborhood. Adding features like a decorative patio, an arched gate, landscape lighting, landscaping and multiple seating levels will all add to the aesthetic appeal of your new pool. You’ll have fun that doesn’t end: vacations and day visits to theme parks are great, but they don’t last. Your new pool will provide lasting fun, year in and year out. In fact, with a new pool, you can vacation whenever you want to, and without the bother of the crowds and noise you’ll encounter at the beach. Of course, when you build your new pool, you’ll want to maintain it in perfect condition so it’s as enjoyable five or ten years from now as it is today. Located in Vero Beach, Reflection Pool Service offer comprehensive services to repair, remodel and maintain your new pool. A family-owned business since 2001, we have the licensed and insured professional staff who service 250 residential and commercial pools throughout the Vero Beach Area. We are committed to providing the highest level of pool service so you and your family can always enjoy a fun a safe pool experience. To learn more about our pool maintenance, repair, and remodeling services, contact Reflection Pool Service today.